Ever since the iPhone dropped in 2007, touchscreen and multi-touch software have really caught on – both in the eyes of the public and device manufactures. I’ve seen my fair share of touch-enabled monitors and All in One PCs and remain unconvinced – not by the utility but more by the ergonomics. Reaching forward and pawing a monitor is fun walking around during tech demos or CES but becomes a hassle when you try to apply it on a day-to-day basis. Apple’s Magic Trackpad is a bit better for translating multi-touch to the desktop environment, but it is a little pricy for a dedicated accessory that you don’t really “need”. Remote Conductor is a turbocharged version of Apple’s Magic Trackpad, utilising your iPad as an iPad-sized wireless multi-touch trackpad with keyboard. Designed to be a fully-fledge mouse replacement, Remote Conductor also supports individual window switching, and utilises the iPad screen to show you all open windows and quickly jump between them. 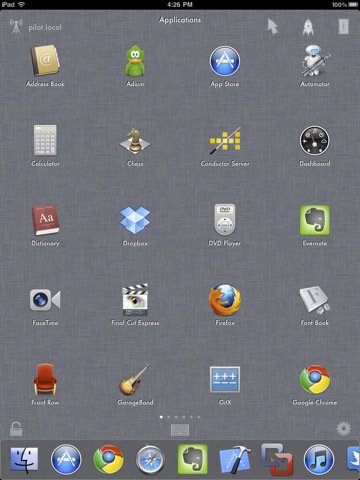 There is also an Application launcher that enables you to browse all the software in your Applications folder and launch it from your iPad. All traffic between your iPad and the computer is secure. Remote Conductor is a flashy “wow” app – the sort of thing you’d show iPad sceptics or detractors as something that tablets are uniquely suited for. It’s fast and responsive as a mouse and the extra input options – despite the initial learning curve – can really aid productivity once you get used to them. The range of available multi-touch inputs runs the gamut from your standard two fingered scroll, to more adventurous four-fingered Expose, Dashboard or Window triggering sequences. Technically you could use Remote Conductor as your primary input device as it comes with mouse and keyboard replacements. Realistically, switching to an iPad keyboard full time is likely to drive you into a seething rage. However, as and when I get a Mac Mini running Boxee under my living room HDTV, Remote Conductor from the comfort of my sofa seems like an excellent input device. I’ve also used it to fiddle with my iMac from the comfort of my bed. You need to install a small, always-on server to hook up with Remote Conductor, which unfortunately is Mac only at the moment. But if you have an iPad and a desktop Mac and have always wanted the two to play nice with each other, I’d have to recommend having a look at Remote Conductor. 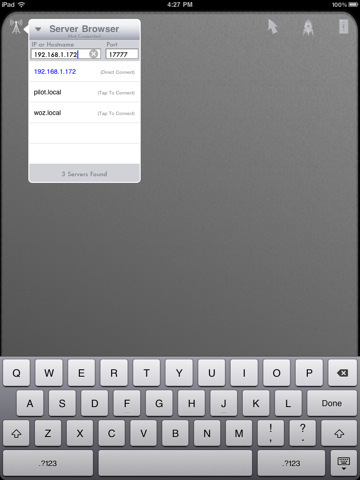 AppSafari review of Remote Conductor was written by Shem Pennant on February 11th, 2011 and categorized under App Store, iPad apps, Remote, Utilities. Page viewed 4397 times, 1 so far today. Need help on using these apps? Please read the Help Page.